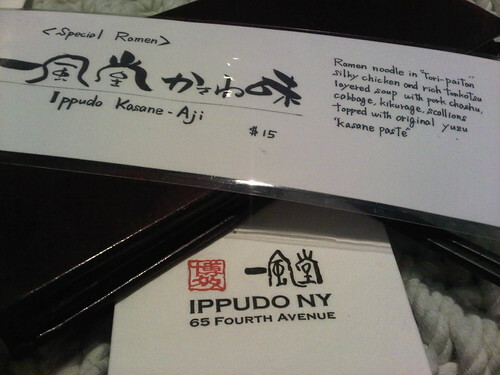 Ippudo NYC – Special Ramen, originally uploaded by everythingsablur. The Pork buns… Divine. I could eat three orders just on my own. The rice buns were fluffy, but had texture and a pleasing mild taste. The lettuce/cabbage added a great snap and crispness. Then there was the star; the pork (I presume belly). Tangy, a little sweet, a little spicy, juicy, perfectly fatty… Very OMFG on the palette. This entry was posted in Around town, Food and Drink, Travel and tagged food, ippudo, new york, ramen. Bookmark the permalink. ← 100 Days to Wedding!